And here, in honor of this day, is a masterpiece of modern folklore: the ultimate politically correct greeting for the season. Please accept with no obligation, implied or implicit, our best wishes for an environmentally conscious, socially responsible, low stress, non-addictive, gender neutral, celebration of the winter solstice holiday, practiced within the most enjoyable traditions of the religious persuasion of your choice, or secular practices of your choice, with respect for the religious/secular persuasions and/or traditions of others, or their choice not to practice religious or secular traditions at all . . .
. . . and a fiscally successful, personally fulfilling, and medically uncomplicated recognition of the onset of the generally accepted calendar year 2000, but not without due respect for the calendars of choice of other cultures whose contributions to society have helped make America great (not to imply that America is necessarily greater than any other country or is the only “America” in the western hemisphere), and without regard to the race, creed, color, age, physical ability, religious faith, choice of computer platform, or sexual preference of the wishee. “Political correctness” was a strawhuman. I hope you have a wonderful day as well, Cathy! Geez. This is why lawyers rule the world. Priceless! This is going to be the small print on our greeting cards next year. 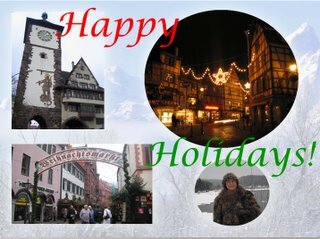 Thank you, Cathy, for this and a wonderful blog, and Merry Christmas, everyone! Merry Christmas, Cathy! Hope you have a wonderful day. Btw, I really enjoy reading your blog. Happy Holidays et al ! oooh can i borrow your greeting? thanks!